Civilian casualties dropped slightly in Afghanistan in 2017, according to the latest annual report from the U.N. Assistance Mission in Afghanistan. UNAMA recorded 10,453 civilian casualties for the year — a nine-percent dip compared to 2016. The UNAMA staff noted a substantial increase indiscriminate use of IEDs such as suicide bombs and pressure-plate devices in civilian-populated areas, which accounted for 40 percent of the total casualties — 1,229 deaths and 2,922 injuries. This was also the year that Afghans witnessed the single deadliest attack since 2001 — the truck bomb that detonated on May 31, 2017 in the diplomatic neighborhood in central Kabul. The attack resulted in 92 deaths and 491 injuries. While the U.N. body and the Afghan government welcomed the continued decrease in civilian casualties throughout 2017, it means little to seven-year-old Omid from Logar province, 60 kilometers away from the capital city. “He was playing with two of his friends outside the house when the gun battle started between the Afghan forces and local insurgents,” Omid’s father told War Is Boring at the Emergency War and Trauma Hospital in Kabul. 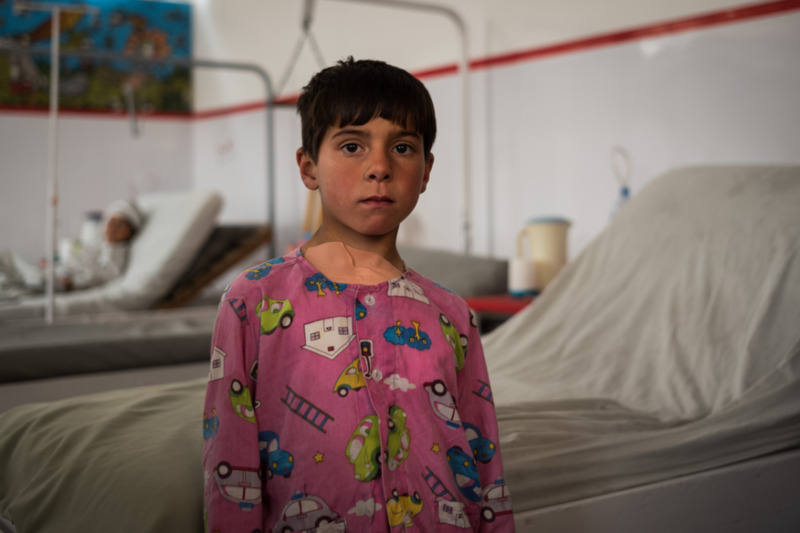 While his friends escaped unhurt, Omid got caught in the crossfire and was hit with bullets in the abdomen and chest, suffering serious internal injuries. Omid is among the 3,179 child casualties reported in 2017 that accounted for 30 percent of the total civilian casualties for the year. A majority of these were a result of ground engagements that have increased alarmingly and affected women and children the most. “Shooting during ground fighting caused more child casualties in 2017, about 534 child casualties — 126 deaths and 408 injured,” the U.N. report stated. Another cause for concern is the increase in air strikes conducted by Afghan and international forces. UNAMA documented 631 civilian casualties from air raids — 295 deaths and 336 wounded. Those casualties represent a seven-percent increase for the year, and the highest recorded figure since 2009. With Pres. Donald Trump’s new Afghanistan strategy, U.S. forces in Afghanistan have increased the frequency of air operations. The Pentagon reported that its forces expended 751 aerial munitions on Taliban, Islamic State and Khorasan Group targets in September 2017 — a 50-percent increase over August. “I like it here [in the hospital] — I have friends here,” Omid said while gazing at the drain inserted in his chest.